SOME economists and planning pundits are foxed by a paradox. While their timetested tools for measuring economic development -- Gross and Net Domestic Product -- indicate that a country is growing rich, they still find themselves at a loss to explain the hidden reality behind the columns of their balance sheet -- a reality that says that countries are actually getting poorer in productive natural resources. Bewildered by this, some Western economists explored the cause behind the phantom poverty in the unaccounted loss of natural resources in the national accounting system. After tracing the root of this anomaly to narrow conventional parameters of accounting, economist Robert Repetto and his colleagues wrote in 1989 in a World Resources Institute report: "A country could exhaust its mineral resources, cut down its forests, erode its soil, pollute its aquifers, and hunt its wildlife and fisheries to extinction, but measured income would not be affected as these assets disappeared." The message came out with stark clarity that a country might as well be a fool's paradise if its national income does not account for real loss in natural assets. Unless corrected, economic policies based on national income indicators will lead to further environmental destruction. The first to act upon this wisdom was the statistical division of the United Nations, which developed the System of Integrated Environmental and Economic Accounts (SEEA). 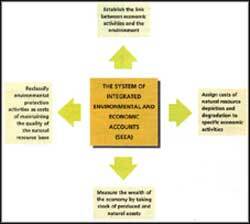 The concept perched on 4 planks: establishing a link between economic activities and the environment; assigning costs of natural resource depletion and degradation to specific economic activities; measuring the wealth of the economy by taking stock of the produce and natural assets; and reclassifying environmental protection activities to account for costs of maintaining the quality of the natural resource base. Test case When applied to Mexico as a test case, the result of the new method was startling. Statistician Jan van Tongeren and Stefan Scheinfest of the UN Statistical Organisation along with senior economist Ernst Lutz from the World Bank and Maria Gomez Luna and Francisco Guillen Martin from the Instituto Nacional De Estadistica in Mexico found to their surprise that Environmentally Adjusted Net Domestic Product (EDP1) was lower (39.7 billion pesos) than the conventional national income accounts (42.1 billion pesos) of Mexico. When adjusted to reflect depletion of natural assets, the net capital accumulation showed a decline from 11 per cent to 6 per cent of the net domestic product (see table 1). Even as the protagonists of the natural resource accounting system, mainly the UN, campaigned zealously for its adoption, it became evident to some that only accounting for environment was not enough. What is also important is who manages the account to keep track of gains and losses in natural assets. Allowing national governments to take over natural resource accounting would further consolidate the substantial powers of the bureaucracy and extend -- at least notionally -- their control over local planning for natural resources such as forests, water, fisheries and soil. This realisation shook up a few among the new tribe of economists who, while dealing with an extremely limited database for natural resource accounting, realised that unless broadened, the new accounting method would still have to depend on national aggregated data on natural resources, currently responsible for keeping economic policies general and inflexible. Should countries then create yet another class of bureaucrats to collect extensive data on the state of natural resources to overcome this drastic shortfall in data? This was a distasteful thought to the new thinkers: past attempts at natural resource management by the state have amply demonstrated that management cannot be successful without the active involvement of the local communities. Therefore, the community must be involved to generate data on its local environment as only then can regional and class variations in natural resource availability and its use be shown with greater clarity, allowing the community to participate in policymaking. Armed with this radical recognition, Sixto K Roxas and his colleagues at the Foundation for Community Organisation and Management Technology (FCOMT), a NGO in the Philippines, mooted the concept of a community accounting system. Explains Roxas, "Communities should undertake planning and manage their resources with the rigour and efficiency associated with economic enterprises." He believes that like an enterprise, the community requires a suitable community accounting system to undertake informed planning. When Roxas prepared a balance sheet for a village named Barrio Tabuan in the province of Laguna, some very useful hints cropped up from his analysis. These the villagers could use for better planning. For Tabuan, the matrix confirmed that they were dependent almost entirely on rice cultvation, hardly ever exploiting the abundant water resource in the village. They exported their produce without processing it, letting go the chance to generate higher incomes within the village. The only intersectoral link within the village was rice feed for ducks. Although the village enjoyed a trade surplus due to higher exports, a large part of this was siphoned off to non-resident villagers as interest or rental income. This first step to informed community planning is the "social accounting matrix", which tries to capture the pattern of resources use in a community, and the distribution of income and expenditure from all kinds of activity among the different sections of the village society. The matrix also lists assets which the community owns and records the liabilities -- such as debts -- incurred while performing that activity. If the community is informed about the difference between its assets and its liabilities, it will get to know the true "community net worth", which is an alternate economic indicator to help the community monitor economic development from its own perspective by comparing the level of community net worth from time to time. From Roxas's matrix, the Tabuans know that while they have assets worth US $281,500, their liability in the form of outstanding debt stands at US $38,900. Therefore, the net worth of the community is US $242,600. Says Roxas, "The social accounting matrix provides a precise description of the ecological and economic circumstances of the community." If the Tabuans are armed with this information, then, while planning for themselves, they would know where to step up investment to ensure that the benefits leaking out of the community are minimised. For example, Roxas's calculation shows that even if the rice exported by the Tabuans were to increase by 10 per cent, as much as 30 per cent of this would seep out of the community in the form of rental and interest income to the absentee landlords: the reason being that rice production is interlinked with other sectors and rice employs a host of different factors. Conversely, almost a similar increase in coconut and duck exports, although lower in value than rice, would remain mostly within the community, with only 11 per cent of it escaping. The community perspective on sustainable use of resources can evolve only if it is completely knowledgeable about gains and losses from of all manner of resource use. Roxas feels that the accounting method should ideally include the value of grazing land, forests, water sources, and other natural resources. The Tabuans, unfortunately, did not place a value on these resources, and Roxas was unable to include them when he calculated their community net worth in 1970 at US $242,600. "These estimates will arm the communities with rigorous economic arguments against large development projects," says Philip Camara, executive director of the Sambales Area Management, Banking and Livelihood Institute (SAMBALI), an NGO based in the Zambales district of the Philippines. This will make the community aware of the extent to which development projects are appropriating its resources by depleting the natural resource base, and how much -- or how little -- the community is gaining from the project in terms of wages and rent. If the returns are not commensurate with what is being appropriated, then, from the community's point of view, the projects are a bad deal; they are not leading to development, a fact that the community accounting system will confirm by showing a decrease in community net worth. Camara cites as an example the 600 MW Masinloc thermal power plant being built in a barangay (village), Bani, in the Zambales province with aid worth US $565 million from Eximbank of Japan and the Asian Development Bank. Camara contends that the conventional accounting system conceals the unjust appropriation of the local community's resources by these projects and is, therefore, biased in favour of these projects. By estimating potential and actual community net worth, the accounting system can be used for planning and identification of projects appropriate for the local economy and ecology. The community can be involved in charting the development path by determining the "best use" of the resources. Alternatively, the accounting system can be used to assess a "region's ecological footprint," says William E Reece, professor of planning and resource ecology at the University of British Columbia. This is essentially the area required to support a region's population of a region at a given material standard. "The maximum rate of resource consumption and waste discharge that can be sustained without impairing the productivity of an ecosystem will determine the carrying capacity," explains Roxas. Only community accounts can indicate how pressure imposes itself upon a community as demands from other communities -- in cities and other countries -- impinge upon the local carrying capacity. Think of this. Conservatively speaking, in the Lower Fraser Valley in British Columbia, about 8.3 million ha of land, in a state of continuous production, are required to support the current level of food and fossil fuel consumption of 1.7 million people. The valley, however, has only 0.4 million hectares. What this region is gorging on is being appropriated from 7.9 million ha -- far in excess of what the community possesses. The export data from the community accounting system will indicate precisely who is appropriating the community's carrying capacity. Due to the highly inappropriate accounting procedure followed at present, natural resources are grossly devalued. For example, in the Philippines, the department of agriculture, which decides about the conversion of agricultural land to non-agricultural use, values the land on the basis of the single most suitable crop and the individual farmer's net income. Prime agricultural land is being converted to industrial or residential use around the metropolitan cities of Metro Manila, Metro Cebu, and Metro Davo -- at prices grossly undervalued. "This approach underestimates the potential value of land in agriculture," says Danilo P Baldos of the department of agronomy at the University of the Philippines***. Agricultural land can have multiple uses and can provide benefits not only to the owner but also to the community living around it. The same expanse can be used to grow fruit trees and to raise livestock, plus give wages to hired labour. "Land should be valued in terms of the highest and best use and the commmunity's net income," concludes Baldos. What this group of economists, of which Baldos is a part, has been proposing is an alternative approach to development and natural resource management to replace the conventional approach which had failed to reach the majority of poor in the Phillipines. Roxas insists that the new approach should establish relationship between different ecosystems -- upland, midland, coastal and river systems -- to understand economic and ecological ties. The environmental consequences of economic activities in a particular area are likely to be felt in another area, and this cause-and-effect should be considered while assessing viability of a project. So people in the uplands should be encouraged not to clear forests and avoid using chemical pesticides to protect the lowland farmers from floods and pesticide contamination. But taking theory to the field has not been easy. The community management system based on community accounting was started in 3 regions in the Philippines: Negros Occidental (1986), Negros Oriental (1988), and Catanduanes (1990). (See box on Negros occidental). "The first task while operationalising the community management approach in an area is to organise the household within the community," says Roxas. His strategy is to build on the existing hierarchy of human settlement, a hierarchy that has developed over time. The pyramid, therefore, has at the base the household, topped by the neighborhood (purok), the village (barangay), the market district team (or municipality) and, at the pinnacle, market district leaders to form economic district teams. Care was taken to ensure that people participated at every stage of the management system; decisionmaking potential was first exhausted at the lowest level before it graduated to a higher one. The process begins with the household. Surveys are conducted to collect information on population, patterns of land ownership and other assets, major occupations, infrastructure and types of economic enterprises to calculate a baseline social matrix. Once the matrix was ready, households were consulted in order to identify livelihood projects. The experience so far has shown that projects that hedge risks by diversifying the local economy are preferred to any other. Further, only those products are promoted which substitute import, draw upon local inputs, are easy to produce, involve many households, and are environmentally benign. Thereafter, community management teams help organise funds for the projects and provide technical and marketing assistance. Unfortunately, all these projects had to be abandoned as funds dried up; being outsiders, NGOs which provided managerial support had to depart when funds petered out. They hardly had sufficient time to train local groups to take over when the time to leave came. Also, the local people saw that the NGOs were strapped for cash for community livelihood projects and lost their interest in the projects. Besides, the sheer scale of the projects left political parties feeling threatened, leading them to muddy the projects' image. Wiser from these failures, Philip Camera established SAMBALI to promote area management projectin the province of Zambales covering 12 villages and this time without external financial support. Without the "donor agency project" label and with the locally entrenched roots of its facilitating NGO, the St Augustine SAMBALI Fund Incorporated (SASFI), the project was assured of success. But SAMBALI has yet to initiate a community accounting system. Camara feels that installing a community management approach to, and maintenance of, an accounting system requires a lot of money and energy, both from the NGO and the community. However, only this year has SAMBALI been given a grant by the Canadian International Development Authority to set up accounting system to be assisted by a network of 16 NGOs. Although it has been established that natural resource accounting alone will not lead to better resource management; it will have to be supported by community accounting. Scarce funds in developing countries like India are a serious obstacle to the implementation of such a concept, particularly in near-subsistence villages. But to circumvent this limitation, Roxas proposes interim measures by governments to initiate policy reforms that will facilitate the application of community accounts. He suggests that, to begin with, management decisions be made the responsibility of the community; further, education at the community level should aim at sensitising students to the environment and should teach them to undertake community accounting. This is the only way to a future with some financial and jurisdical independence, necessary for a sustainable, safe environment.